Austria’s largest airport has approximately 23 million passengers per year (as of 2017). Schwechat. Vienna Airport ranks about 20th on the list of the largest airports in Europe. It is the only major airport in Austria. It is about 10 times larger than the second largest airport in Austria (Salzburg). The layout is typical for an airport. It has two floors, in the lower floor is the arrival, in the upper floor the departure. Vienna Schwechat Airport has three terminals. These terminals are next to each other and look like one building. You reach everything in the airport in a few minutes on foot. Below the main building is a modern railway station. Internationally, the airport is usually called „Vienna Airport“. In general, the airport makes a very good and modern impression. There is also enough space. The buildings are generously built. The connection to the local traffic is excellent. There are many free toilets, well thought-out signposts and information signs. 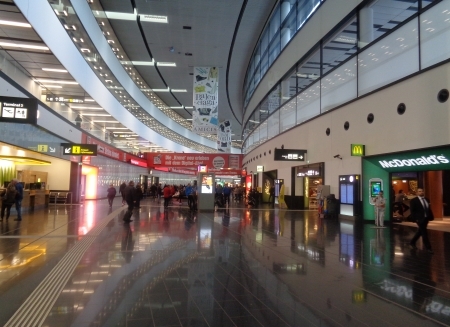 Vienna Schwechat Airport is a good example of a successful infrastructure project. For us, it reinforces the general impression that in Austria, especially in terms of transport infrastructure, much has been better in recent decades than in Germany. By this we do not only mean the chaos surrounding the new Berlin airport. The fastest and most modern train between Vienna Airport and the city centre is the fast and modern CAT (City Airport Train). It takes only 16 minutes to get to the Wien Mitte station. For comparison: It took us almost an hour by car. The train CAT arrives relatively centrally at the station „Wien Mitte“ (also called Wien Landstraße). From here you can take the S-Bahn (2 stations to the main station), 2 underground lines or a taxi. The fare for the fast airport train from Vienna is 11 euros one way. If you travel with this airport train from the city to the airport, you can already check in the luggage of some airlines at the city railway station Wien Mitte. 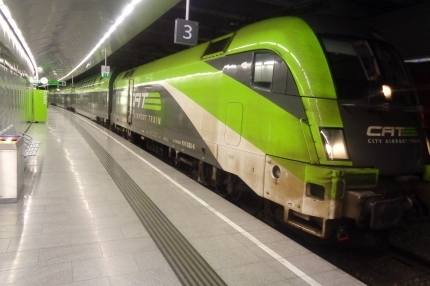 During the day, the Flughafen-Express-Train Vienna (CAT) runs twice an hour (every 30 minutes) between Vienna International Airport and the city centre in both directions. In addition, there are normal suburban trains to and from Vienna Airport with several destinations in the city. These are slower, but cheaper. 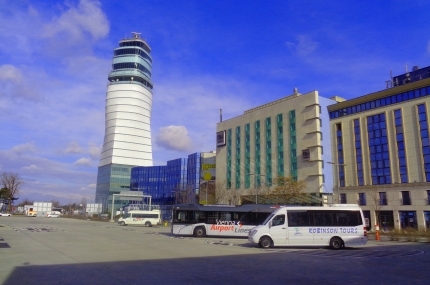 There are also airport buses to the city. You depart directly in front of Terminal 3 on the lower floor (Arrivals). The journey time to Vienna City by bus is considerably longer than by the airport express train and depends on the current traffic situation (commuter traffic, etc.). There are also long-distance buses from Vienna Schwechat Airport to other cities in Austria and abroad. The many buses from Flixbus to Graz, Budapest and Bratislava, for example, are inexpensive. Direct trains in the long-distance traffic of the Austrian Railway run from Vienna Schwechat Airport to many large Austrian cities. There are direct rail connections from Vienna Airport to Graz, Linz, Salzburg and even Innsbruck. These are, for example, Intercity trains or very often even faster Railjet trains. The prices at the airport are fortunately not too high. 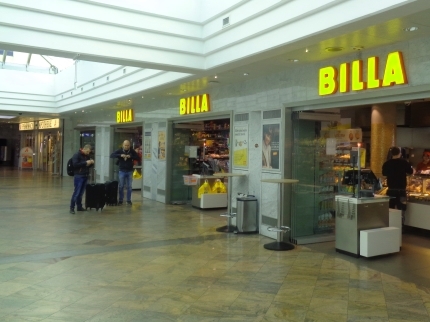 In Terminal 1 there is a supermarket (Billa) with normal prices like in the city. Here in March 2017 we bought a can of coke for 79 cents and half a litre of mineral water for 55 cents. Also simple snacks, like warm Leberkäse (meat loaf) in bread rolls or meat in bread rolls (in Austria called Fleischlaberl), have the same prices in the Billa as in the rest of Austria (about 2 Euro). Smokers and beer lovers can go to one of the pubs in the airport. In the Irish Pub „The Dubliner“ a large Irish beer (Guinness or Kilkenny, 0.5 litres) costs 4.80 € in March 2017. A cheap price for a major international airport. Another nice beer bar is Johann`s Biereck. Both pubs are for smokers. Cheap food is available at Vienna Airport in the Burger King (Termial 1) or Mc Donalds including McCafe. These two fast food restaurants have normal prices, there is no airport surcharge according to our impression. In our opinion, the normal restaurants and the self-service restaurants in the airport are not quite as inexpensive. But we have already seen airports with much higher prices for food and drinks. Opposite the airport there are some streets with modern buildings like bigger hotels. If the waiting time is too long for you, you can go to the airport visitor terrace. From there you have a good view on a runway etc.. The visitor terrace is open every day from 8 a.m. to 10 p.m. in summer (from May to September). In winter, the opening hours of the viewing platform are approximately shorter (10 a.m. to 8 p.m.). Unfortunately, the visitor terrace at Vienna International Airport costs admission. At the beginning of 2018 the entrance fee will be 5 Euro for adults and 2 Euro for children. From 5 p.m. there is an inexpensive evening ticket for 3 Euro and 1 Euro for children. Tourists who have the great Vienna Pass can visit the visitor platform free of charge (>>> more info Vienna Pass).